Mornings are crisp and the days colorful. Everything is alive, twirling and swirling in the breeze. Spices scent the air, the last harvest is reaped, and gardens go dormant with a bed of leaves gently coating the ground. The rains signal salmon to journey home and spawn, giving life to their offspring. Fall is in full force and with it more days spent indoors with families gathering together, the perfect occasion to plot next spring’s planting and start crafting for critters – just in time for the holidays. What better way than with a miniature fairy garden! 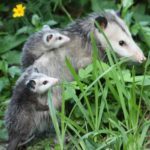 Through the National Wildlife Federation’s Garden for Wildlife program, you can create and certify a wildlife-friendly garden or habitat in just about any outdoor space. Whether it be your yard, balcony, local park, school, or place of worship – you can join the growing community of people committed to creating and restoring habitat for wildlife. Critical pollinators like birds, bees, and butterflies will thank you. To certify a garden, there are four basic elements that all wildlife need: food, water, cover, and places to raise young. Using sustainable gardening practices such as conserving water and reducing chemicals creates even more wildlife-friendly conditions. Building a miniature fairy garden and practicing the selection of wildlife elements can motivate you to certify your own life-sized garden. In the spirit of creating wildlife habitat, below are some tips, design elements, and steps to consider when planning your mini garden whether it’s indoor or outdoor, live or replica. Plan before you purchase – Scope out supplies by visiting multiple craft stores or online vendors that sell miniature fairy garden materials. Each store may have various whimsical styles of figurines that can inspire in different ways and allow you to mix and match. Make it homey – Include accents, trinkets, furniture, and accessories to add personal touches to your garden design. Think multi-level and three dimensional. Upcycle – Re-use materials you already have on hand such as containers, broken pots, natural outdoor features (like a tree stump or flower bed) and small items you can find in your own backyard (sticks, stones, feathers, etc.). Second-hand thrift stores make for savvy and sustainable shopping. Have a theme – Spark your imagination with a theme such as a seasonal one for an upcoming holiday or celebration. Tiny gardens make great gifts to ourselves and others, plus they are fun projects for kids, families, and classrooms. Need ideas? Search for pictures in magazines, books, online DIY posts and bulletin boards. Food – Trees, shrubs, grasses, wildflowers (nectar and pollen sources), twigs, ferns, potted plants, cacti, succulents, pine cones, nuts, seeds, mushrooms, berries, leaves, feeders, etc. Water – Birdbath, fountain, pond, pool, lake, river bed, ocean, wet sand/mud (for butterfly puddling areas), etc. Cover/Places to Raise Young – Plants (such as food sources listed above), bird/bat houses, roosting boxes, nests, bee condos, toad abodes, stick piles, logs, moss, mulch, shells, rock walls, gravel/pebbles, soil/mud, caves, etc. Craft supplies – Glue gun and glue, scissors, wire cutters, wooden dowels, hammer, gloves, shovel, tablecloth, etc. Hardscapes (the work surface) – Pot, planter, terrarium, tree round/cookie, stump, natural feature (hole in a tree), basket, etc. Accessories (how people enjoy nature) – Homes, campers, tents, forts, tables, chairs, benches, swings, arbors, gazebos, LED solar lights, marbles, stepping stones, stairs, paths, gates, fences, bridges, garden tools, planters, statues, bikes, boats, etc. #1 – Create a hardscape by planning out the structure of your garden with items such as pots, potting soil, rocks, moss, plants, etc. In the example of the winter wonderland pictured above, the wooden tree round or cookie (the base) along with the layout of the trees, walking path, and bridge form the basis of the design. #2 – Incorporate habitat elements and accents (see birdhouse, bird bath, snowy trees, and pond in winter wonderland). #3 – Add wildlife critters and other enchanting garden guests like fairies, gnomes, and trolls along with accessories (like the street lamp and sign). #4 – Certify! Include a homemade Certified Wildlife Habitat sign as a symbolic way of showing your commitment to wildlife. If you receive the National Wildlife Federation’s e-newsletter or catalog you can often find an example of the sign to cut out or simply visit Garden for Wildlife, scroll to the bottom of the page and print. Now that you’ve practiced your habitat planning skills through a miniature fairy garden – certify your own backyard, school, or community space. Take pride in doing your part to attract garden guests.